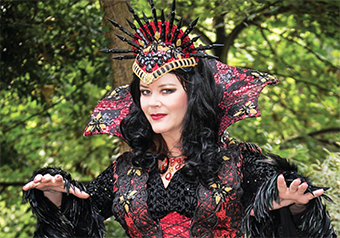 IT WILL be Josie Lawrence’s first stab at panto, but she is relishing the task of taking on the role of the Wicked Queen. Surprisingly, Snow White and the Seven Dwarfs at Guildford’s Yvonne Arnaud Theatre will be the first panto for the 55-year-old comic and actress. Josie says she now can’t wait to get going with the seasonal favourite. “Some actors pooh-pooh panto, but I’ve never felt that way,” she explains. “If you get it right, it’s a wonderful skill for an actor to learn. I’ve done Chekhov and Shakespeare – that’s my first love – and I’ve also done musicals and improvisation of course. The big question, of course, is that as the queen of improv – thanks to years of appearing on TV’s Whose Line Is It Anyway? – will she be ad-libbing her way through Snow White? It’s also what she remains best known for despite a long and very varied career. Even a stint in Britain’s biggest soap, EastEnders, hasn’t changed her reputation for comedy and improv – although she appeared in 49 episodes as Manda Best. “Everybody is so good and they work so hard on that show,” she says. “You have to get to Elstree studios by 6.30am every morning, but they were really like a family. Meanwhile, she’ll be playing the Wicked Queen alongside Amy Matthews as Snow White, June Whitfield on video as the Spirit of the Mirror, and seven dwarfs who include Ray Griffiths (from Willow, Star Wars and various Harry Potter movies). SNOW White and the Seven Dwarfs will be at the Yvonne Arnaud Theatre, Guildford, from Friday, December 5 until Sunday, Jan 4.